Holiday season had a strong opening with Black Friday and Cyber Week record breaking sales. Let’s look at the numbers and trends emerging this season. This year’s Black Friday and Cyber Week’s rush is coming to an end, and has proven there’s nothing impossible in retail with the impressive total revenue of almost $60 billion. Let’s take a look at the at numbers in more detail and scrutinize most disruptive and thus meaningful trends that emerged over that period. 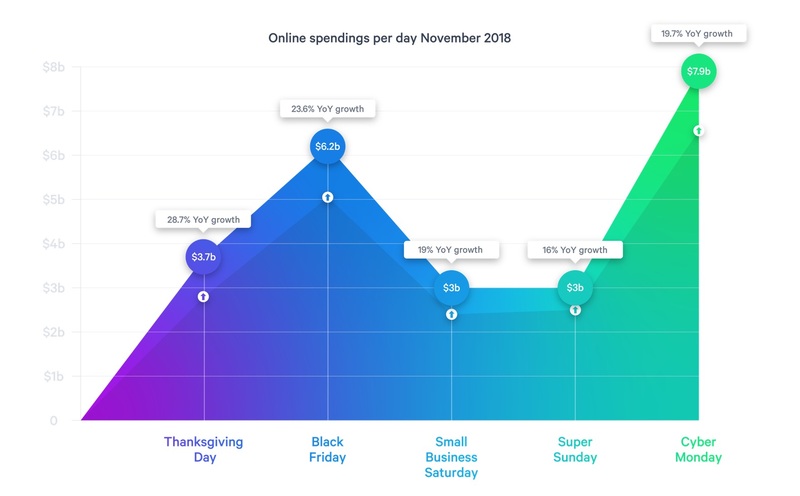 How much did we spend online in November? According to Adobe’s report, this year’s November digital spending grew by almost 20% in comparison to 2017. On average, shoppers spent $1 billion every day throughout the entire month, with the period around Black Friday and Cyber Week breaking all times records. Digital revenue on Thanksgiving 2018 hit almost $4 billion, whereas Black Friday topped the expectations with more than $6 billion made in online sales. The weekend after Thanksgiving established itself as the biggest shopping weekend in the U.S, with the sales exceeding $6 billion. The cherry on top of the retail cake was Cyber Monday during which spending rose by almost 20% compared to last year’s. By the end of the day, online sales reached a record $7.9 billion, making it the biggest online shopping day of all time in the U.S.
More than half (56%) of online transactions were completed on mobile devices. Click-and-collect services rose by 65% year over year. 74% of holiday shoppers say that promotions play a significant role in their holiday shopping. Retailers saw 28.8% more sales and 13% more traffic on Black Friday than on Cyber Monday. Brick-and-mortars saw 28% higher conversions thanks to the blending of online and offline shopping.